SuperSpeed USB 3.0 Ports: USB-C Gigabit Ethernet hub with 3 SuperSpeed USB 3.0 ports (blue ports) for data transfers of up to 5 Gbps. USB-C Power Delivery: Charging the new MacBook, ChromeBook Pixel and USB-C-compatible tablet computers with their original chargers while hub is in use. 1 gigabit ethernet port gives access to superfast network speeds, backward compatible with 10/100/1000 ethernet. 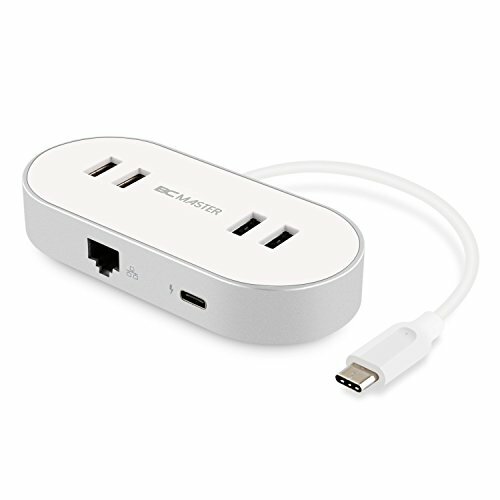 Supports hot swapping & plug-and-play, and a built-in surge protector incorporated to safeguard your USB devices.